Have you ever seen a more beautiful stack of pancakes than this shortstack from Freida’s? I think not! In the heart of downtown Willmar, Frieda’s is a family-run restaurant that features incredible old-school diner food. If you’re a local, you know that Frieda’s is one of the best places to stop for breakfast. The consensus between me and my family is that the pancakes are Frieda’s defining feature. Served before 10:00 a.m., you can order a short stack with a pat of butter and drenched in syrup. Diners, Drive-Ins, and Dives: if you’re reading this blog, give Frieda’s a feature. You won’t be sorry. 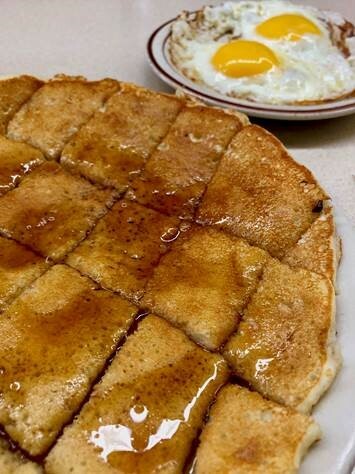 You might not picture a truck stop as the spot for a good breakfast, but then you’d be missing out on a delicious start to your morning. The Hillcrest Truck Stop is a classic country diner — rustic decor, hearty meals, and friendly waiters and waitresses—that will make you feel right at home. Almost every time I visit Hillcrest, I order a cheese omelet with a side of hash browns. You can choose the fillings in your omelet, ranging from bacon to ham to onions to cheese, cheese, and more cheese. The hash browns are the perfect side, dipped in ketchup to add a sweeter flavor to the mix. And at the truck stop, breakfast is served all day long. So you could come in for an early morning cup of coffee with friends or drop by on a Saturday afternoon after a hike through the Prairie Woods Environmental Learning Center. Either way, Hillcrest will be ready to serve you an order of a cheese omelet and a side of hash browns just the way you like it. 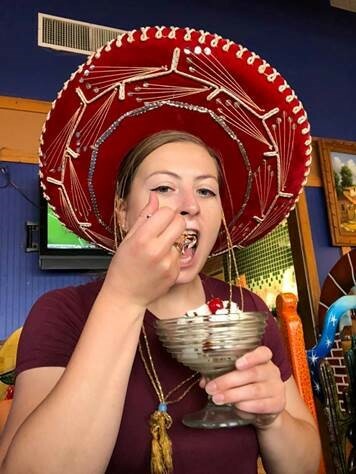 Frozen in mid-bite, I’m polishing off a complimentary birthday sundae over the lunch hour at El Tapatio. With a lively and festive decor, El Tapatio is a Willmar favorite for a reason. And their affordable lunch specials make this restaurant the ideal place for a lunch break. One of my go-to picks is the #16: the lunch fajitas. Served with a choice of rice, lettuce, guacamole, pico de gallo, sour cream, flour tortillas, and a choice of refried beans or black beans, these sizzling fajitas are the best lunch special. You also get to pick your protein: you can get the fajitas with steak, chicken, shrimp, mazatlan, steak and chicken, or even steak and chicken AND shrimp. As an added bonus, all meals at El Tapatio come with unlimited chips and salsa. What more could you ask for at a Mexican restaurant? My father, a Willmar resident of 48 years, swears that this is the best pizza around the area. The Gio, short for Giovanni of course, is the pizzeria’s signature slice, loaded with pepperoni, sausage, onions, green pepper, and mushrooms with “extra extra” cheese. My father orders a Gio for every Vikings game, almost every birthday party, and whenever he finds out there’s a good special going on at Giovanni’s. So you could say we stop into Giovanni’s every once and a while. Add a side of breadsticks and you’ll have a meal that the whole family can get behind. The ginormous burrito is smothered in red, white, and green sauces to look just like the Mexican flag. 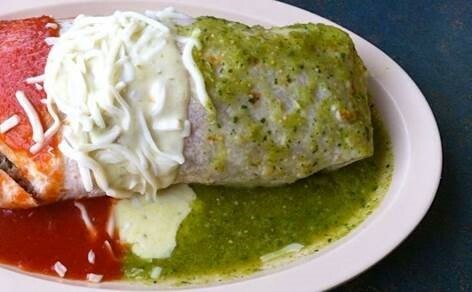 you can order just the red smothered burrito or the green smothered burrito. And on the inside, you can choose between pollo (chicken), asada (steak), pastor (pork), league (tongue), carnitas (shredded pork), quest (cheese), and chicharron (Salvadorian pork). The online Yelp! reviews go on and on and on about how incredible these big burritos are, so you should visit downtown Willmar to see what the hype is all about! Walleye is a favorite in Minnesotan cuisine, showcasing the very best fish to come from the local lakes. O’Neil’s, in Spicer, is one of the many area restaurants that serves this freshwater fish dish. Lightly breaded with a Parmesan cheese mixture and seared to a beautiful golden brown, the Parmesan walleye is served with a baby spinach, onion, and lemon-dill aioli. And if you add a side plate of Minnesota Poutine, you’ve got the perfect (fried) dinner. The Minnesota Poutine is O’Neil’s take on the Canadian classic, topping their crispy house fries with mozzarella, bacon, and beef au jus gravy. It’s the ideal ooey gooey masterpiece to pair with a nice serving of walleye. Nothing says Minnesota like fresh fish and fried food, am I right? The list could go on and on and on and on. If I’ve missed your favorite dish from a restaurant around the Willmar Lakes Area, comment and let me know! I’m always looking for my next meal around the area and would love to hear your recommendations to expand my list of delicious dishes.